During National Nurses week 2015, from May 6 – 12, we acknowledge and celebrate the excellence and dedication of those who choose the nursing profession. I grew up surrounded by nurses in a nursing home that my family owned and operated. The patients were mostly elderly people who had the usual physical and mental problems related to aging, but we lived in a rural area and my mother’s skills as a Registered Nurse also made her the go-to person for many emergencies around the village – cuts, burns and even broken bones, head injuries and emotional problems. I can see my mother calmly cleaning and dressing a bloody wound caused by broken glass and, on another occasion, carefully positioning a child’s possibly broken leg after a fall from a tree. Eventually, a doctor might become involved, but watching my mother and her colleagues in action day after day offered me firsthand knowledge that nurses, always women in those days, were unsung heroines. Nurses in war zones and military settings have done their job quietly and largely unnoticed as well, putting their lives in peril on the battlefield for centuries. Yet, little is known about their experiences in war or exactly how many participated. Even appropriate financial remuneration has been meager and long in coming. Only at the end of the twentieth century did nurses’ pay, both in military and civilian life, begin to become commensurate with the risks and responsibilities of their jobs. Many women served as nurses during the Revolutionary War, but they are barely mentioned in history books. The Second Continental Congress, heeding George Washington’s advice to establish a means of caring for wounded and sick soldiers, authorized the formation of hospitals. In July of 1775, congress initiated a plan to provide one nurse for every ten patients and a supervising matron for every ten nurses. But, nurses were not always easy to find and formal training was nonexistent. General Washington blamed the low compensation rate—originally $2 a month—for the shortage of nurses, but it’s more probable that a woman risked receiving a bad moral reputation if she wanted to be a nurse. Congress did increase nurses’ pay a year later, to $8 a month. Louisa May Alcott, long before Little Women, had a brief career as an army nurse during the Civil War. Her first publication, Hospital Sketches, was a detailed account of her experience. Louisa was an unknown but zealous patriot when she arrived in Washington, DC, in 1862, to work in the Union Hotel Army Hospital. She had read Florence Nightingale’s Notes on Nursing and Dr. Home’s Report on Gunshot Wounds, but that was the extent of her training. She described in letters to her family that, on her first day, “…stretcher after stretcher arrived from the battle of Fredericksburg…each with a legless, armless or desperately wounded occupant.” Louisa cared for hundreds of soldiers with devastating wounds and loss of limbs, working with little more than soap, water, and whiskey. Her descriptions were so vivid and evoked so much emotion about caring for the wounded, that the Union Army published her book and provided it to the families of soldiers. This small volume established her reputation as an author, but her experience devastated her health. She contracted Typhoid Pneumonia after six weeks and would suffer from the poisonous effects of treatment with mercury until her death in 1888. 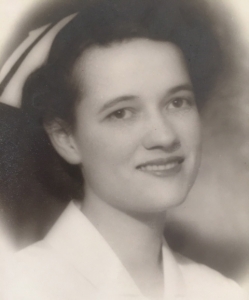 Growing up around nurses in the 1950s I was privy to occasional stories and vivid memories. One former army nurse would sit at a picnic table with me and my brothers during her break-time and suddenly launch into a story. She once described being one of sixty nurses attached to the 48th Surgical Hospital and climbing over the side of a ship off the coast of North Africa and down an iron ladder into small assault boats. Each boat carried nurses, medical officers, and enlisted men. The nurses wore helmets and carried full packs containing bandages, medicine, gas masks, and canteen belts. Only their Red Cross arm bands and lack of weapons distinguished them from fighting troops. They waded ashore and huddled behind a sand dune while enemy snipers took potshots at them. Before the night was over, their commanding officer ordered them to an abandoned civilian hospital, where they began caring for casualties. There was no electricity or running water, and the only medical supplies available were those they had brought themselves. We jumped out of our seats when she described the rat-a-tat-tat of enemy fire overhead. “ We held flashlights so that the doctors could operate,” she said. Nurses were not spared capture and imprisonment. In 1945 U.S. troops liberated sixty-seven army nurses who had been imprisoned in Santo Tomas Internment Camp since 1942 and evacuated them to a convalescent hospital on Leyte where they recovered from malnutrition. Like many men who saw the worst of war, these women came home and slipped back into their communities and rarely shared their experiences. During the Korean War, Army nurses served in medical units close to the front lines, in field hospitals, on army transport ships, hospital trains and at Mobile Army Surgical Hospitals (MASH). By chance, the general public has more knowledge of nursing services, especially during the Korean War, thanks to popular culture. The fictionalized depiction of a medical unit portrayed in the film, MASH, and a subsequent TV series featuring “Hot Lips” Hoolihan, offered a romanticized version of women nurses in wartime, but at least it demonstrated that they were there. Nurses have served in untold numbers in wartime even before Florence Nightingale went to the Crimean War and became known as “the lady with the lamp.” I’ve been comforted by the thought that nurses were near the battlefields of Vietnam in 1969 to care for my husband in the brief moments he survived after being mortally wounded in a booby trapped bunker. I may never know who they are, but I’m sure they eased his departure with skill, calm and compassion. I’m deeply grateful for all those who choose to be nurses. Thank you – this week and every week.